For almost 7.5 million people around the world, George Takei is one of the best things about their Facebook feed. He’s gathered a massive following online including people who’ve never watched an episode of Star Trek, the show that first brought him to fame almost fifty years ago. While some may only know him from the humorous daily posts on his social media accounts, this documentary by Jennifer M. Kroot and Bill Weber introduces viewers to a man with a tumultuous past who managed to forge a path to success despite the odds that were stacked against him. The film doesn’t focus for very long on any of the various facets of his life, scattering interviews with friends and co-workers alongside intimate moments between George and his husband, Brad. The couple have been together for over 25 years and, since getting married in 2008, have become outspoken proponents of marriage equality and gay rights. To Be Takei is most successful when it delves into more difficult history. Takei’s family, along with over 8,000 other Japanese-Americans from California, were sent to an internment camp after the bombing of Pearl Harbor. Held in the swamps of Arkansas at the Rohwer War Relocation Center, he says that they were “incarcerated because we happened to look like those who bombed Pearl Harbor,” giving a chilling description of how life in the camp became normal over the three years they lived there. As a boy, he was always looking beyond the barbed-wire fences of imprisonment and got involved in the high school drama program after his family resumed their lives in Los Angeles following the war. 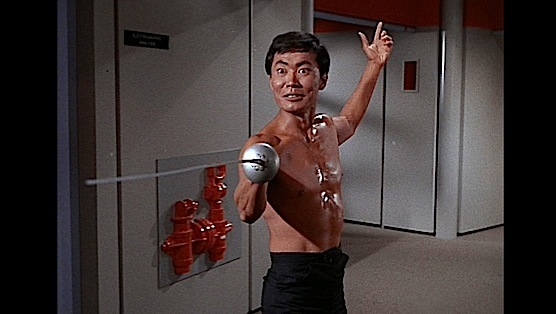 While his initial foray into acting left him stuck with stereotypical roles in two Jerry Lewis comedies, it wasn’t long before he would be cast as Lt. Sulu on Star Trek, a huge achievement at a time when there was minimal visibility for Asians in popular culture. Fellow cast members like Leonard Nimoy and Nichelle Nichols are interviewed here, offering thoughtful and caring observations about their co-worker while contemporary Asian actors like B.D. Wong reflect on how powerful it was to see Takei on a weekly television program. William Shatner takes a more combative approach. (At one point, he explains “I don’t know him, and he does not know me.”) Their rivalry clearly punctuated by uncensored footage from a Comedy Central roast of Shatner that makes it clear that the two men are not on friendly terms. As a love story, perhaps the most refreshing thing about the documentary is being able to observe a long-term gay couple in such a normal, everyday way. We do occasionally see George and Brad sparring with the vigor of any pairing together for as long as they have been, but it’s almost always with humor. Aside from a minor freakout that Brad has at the beginning of the film over not wanting the location of their home to be visible on screen, he mostly just seems to balance their relationship and work hard as a loyal companion (and manager). There isn’t much effort here to dig deep beyond the surface story, which is undoubtedly inspirational to many. With a subject as charismatic and likable as Takei, I’m not sure that it really matters. Running a compact 93 minutes and featuring a plethora of familiar faces, the film should be enjoyable even to those who are only casual fans. To Be Takei is a slight, but amusing portrait of a self-made man who not only attained the American Dream, but managed to successfully reinvent himself into his seventies. Matt is an Austin resident who is a rabid collector of physical media, especially Criterion Collection Blu-rays. He’s also the former music director and on-air host of indie rock Internet radio pioneer, WOXY.com. You should probably follow him on Twitter.